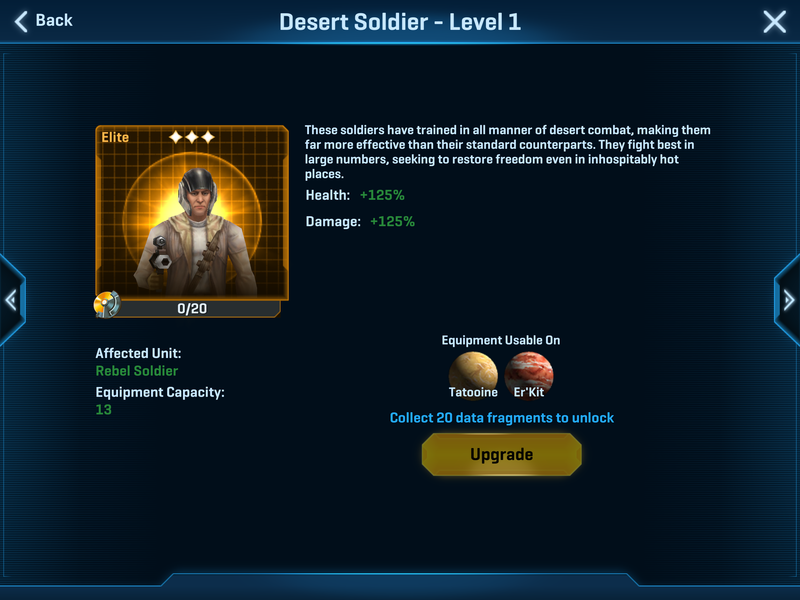 Both the Ithorian Infiltrator (Rebel) and Kubaz Invader (Empire) are now Event Only Unlockable / Up-Gradable Infantry Units - NOT MERCENARY - which is a good thing! What's not mentions is the added buffs on existing equipment. Check walls,turrets,and HQ for example....level 8 or 9 have over 100-200 percent buff. Planetbleeder wrote: What's not mentions is the added buffs on existing equipment. Check walls,turrets,and HQ for example....level 8 or 9 have over 100-200 percent buff. Yes it is in the Game Developer Notes shown here toward the bottom but I did not this time type them out. Here's a 1min video that shows all the structure & unit changes @the levels I sit currently. 125% and 153% buffs on troopers and heavies are massive. Unlockable infiltrators is also significant. Didn't see this coming. Remember, I'm pulling for you. We're all in this together. These buffs to buildings are insane. Euph wrote: These buffs to buildings are insane. Agree 100% It feels like the defenses were buffed to counter the new desert equipment however the defenses (hq, walls,turrets, etc) are good on all planets. 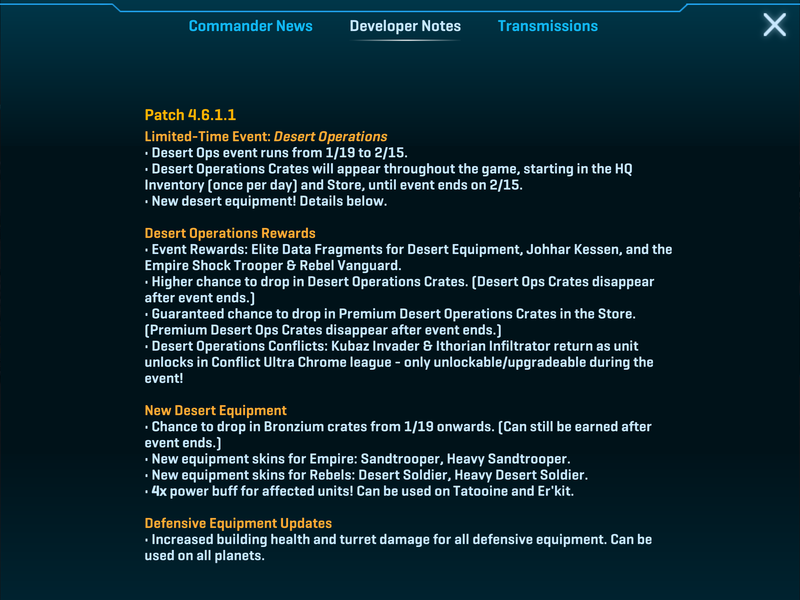 The issue I see is players won't have the firepower on non-desert planets to overcome these new buffs (actually players won't have the firepower until they unlock them). But I just don't get this logic: defenses apply to all planets but the new super troopers are only on the desert planets. Level 1 heavy desert soldier has a 153% buff but if I go to a green planet, my level 4 Gigorans (which are the heavy equipment on Yavin, Dando, Tako) have 37% buff. Seems kinda lopsided to me. I feel this presents an interesting dilemma. Given the ridiculous buff to turrets in both damage and hit points, I am seriously considering changing all of my turrets to the three with equipment available - or most of them, anyway. But.. since buffs cannot be applied in squad war.. that would be a big disadvantage there. In any event, even before anybody has made significant changes to their designs to take advantage of the changes, attack has become a LOT harder, just through the amount of time it takes to chew through these ridiculously buffed structures. I hate to think how it will be once people learn how to properly take advantage of it. It's obviously early days yet, but my gut reaction is that this was a huge error by the devs. I'll just say if it were up to me I'd fire the leadership overseeing this game.... they clearly don't actually play this game and are laughably out of touch with the player base.